Alfred won't find any app I search for to launch. I do see that there have been threads about this before but, so far as I can tell, those seem to be cases where neither Alfred nor Spotlight can find them. And in my case, Spotlight is working fine. I'm on the latest version of Alfred but this has happened since I moved to macOS Mojave and a new boot drive. I thought at first it was an indexing thing and that it would sort itself out but not so far. And as I say, Spotlight finds everything right away so the indexing appears complete. Hi @WilliamGallagher, welcome to the forum. Can you give us some more information than that please? For example, which apps isn't Alfred finding and where are they on your system. Thanks. It's *all* apps and they are all in the regular Applications folder. Regardless of any app I search for, it gives me the option to search Google and so on instead of my Mac. Got you. What happens after you run the "reload" command in Alfred? Does that help? Can you also check your Search Scope in Alfred Preferences > Features > Default Results? Make sure that /Applications is in the list. @WilliamGallagher Could you please install the Alfred metadata tool and drag one of your apps to it? If you could please paste the output here so that we can take a look, I'm curious to see whether the file types are correct for your apps. Unable to obtain metadata for this file! /Applications/Final Draft 11.app: could not find /Applications/Final Draft 11.app. Thanks for the tool: I don't understand why it's not getting metadata when I can open and run that app just fine, but it's a big clue, isn't it? deanishe I've also tried the Reload command and it doesn't seem to have made a difference yet now I'm not surprised. One more thing I've found that's nothing to do with Alfred but is another clue: Apple Mail won't find any old emails I search for. There's something seriously wrong here, isn't there? I don't know what to do next but thanks for clearing up that it, presumably, isn't Alfred. It's not Alfred. Your system's metadata index is messed up. It's not the issue of the system index because I have the same problem with alfred's searching tool. Some of the apps cannot be found by it, especially the newly installed. Same thing happens to the file search. I tried to rebuild the system index but nothing changed, while Spotlight works fine. @qydxyx Did you follow the recommendation to delete the Spotlight-V100 when beginning the rebuilding of your Mac's metadata index? 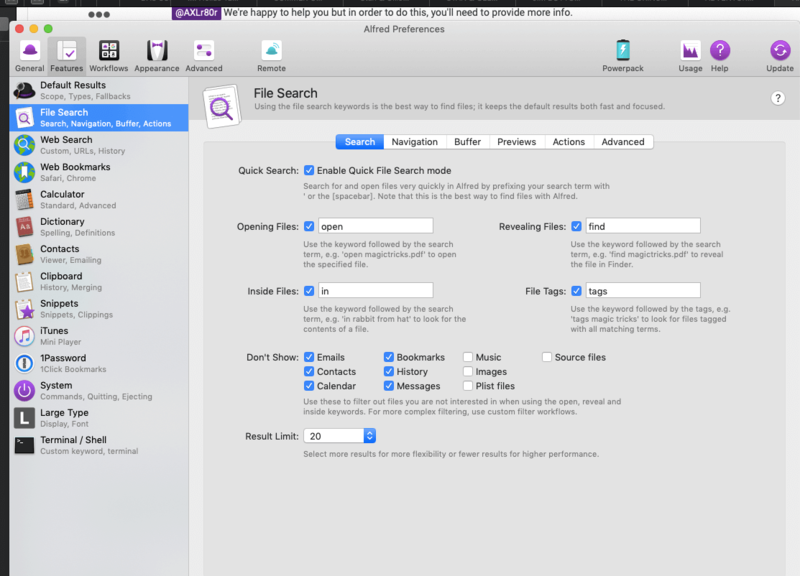 Spotlight may have some files/apps cached even while the file system needs to be rebuilt. - For apps, did you type "reload" into Alfred to refresh the application cache and see whether they become available? I run latest version of Mojave and latest Alfred. This error was in High Sierra and earlier Alfred as well. Started a couple of months ago. @Cacao As with the users earlier in this thread, could you please install the Alfred metadata tool and drag one of your apps to it? Please paste the results here so that we can help you establish whether there's a metadata issue. /Volumes/GoogleDrive/Min enhet/Market/Market 2019/Partners/Partners 2019.gsheet: could not find /Volumes/GoogleDrive/Min enhet/Market/Market 2019/Partners/Partners 2019.gsheet. @Vero Any idea what the problem might be? @Cacao Based on the first file you provided, we can establish that there's absolutely no metadata for that file, so it won't show up in results as there's no file type or information as to *what* it is for Alfred to decide whether to include it in your results. As for the second one, what do you type into Alfred when searching for it? Is your Google Drive in Alfred's search scope? You could also experiment with moving the .eps file to your desktop where it'll become indexed as a "normal" macOS file, without the potential odd behaviour from being managed by Google Drive. Hi, I have the same problem. Alfred can't find my files, while spotlight does. Could you please give me your advice? Thank you. kMDItemCopyright = "Copyright © 2012 Running with Crayons. All rights reserved." @AXLr80r can you paste in the metadata for an app you're looking for instead of Alfred 3.app - Alfred, by design, does not find his own app package. As you can see from the results, there is no metadata for this file, as most of these fields should be populated. The first step would be to rebuild your Mac's metadata index, which you can do by going to Alfred's Advanced preferences by clicking "Rebuild macOS Metadata" and following the steps. This can take up to an hour to complete, but once it's done, dragging the same file should show some metadata. Please do this and let us know how you get on. kMDItemDisplayName = "deltaCast s02e05 _ ev3rydayGnuPG - Part 1_2.mp4"
kMDItemFSName = "deltaCast s02e05 _ ev3rydayGnuPG - Part 1_2.mp4"
@AXLr80r We're happy to help you but in order to do this, you'll need to provide more info. What are you typing into Alfred to search for this? I can see you've been Alfred for a number of years so were you previously able to find these files and the issue started recently? Which version of Alfred and macOS are you using? I really can't remember when the issue started. As long as Spotlight finds it, it didn't bother me so much. I hope the screenshots can help you figure out a solution. What are you expecting to find with the last keyword? What kind of file type? Is it in your default results? Have you checked the metadata for the relevant files/folders to make sure the metadata is there? That's why i typed "ev3ryday" and "deltacast". It is also shown in the first line of the pasted results above. Well, yes, that's was the case. I didn't search with a space! All files are now in the search results.